Ning Mercer Woodcut Talk: December 28, 2-3 p.m. Opening Reception December 14, 5-7 p.m.
Ning Mercer will explain the process of creating woodcut prints with a slideshow at MarinMOCA from 2-3 on December 28. Free to the public. 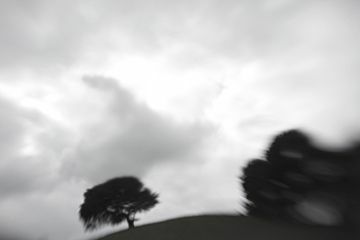 MarinMOCA presents THE HUMAN EXPERIENCE, artwork by Bay Area artist Ning Mercer. It includes her work in oil paintings and woodblock prints, as well as sculptures and drawings, with a focus on her passion and interest in our human stories. The images in the show are from her personal encounters with people of different walks of life and culture, thru her day-to-day experience and her travels around the globe. Whether it is innocent children at play, or grownups going about their lives, she finds her artistic inspirations from our human experience as a whole. 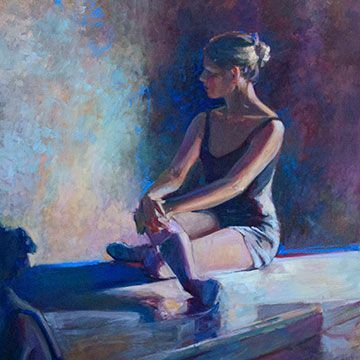 Ning Mercer will be at the opening reception to share her "behind the scene" tales of each of her work. Art and art making has always been part of Ning Mercer’ life. From making figurines with mud found in her schoolyard to becoming a professional artist, it has been a long and fruitful journey for her - a journey of growth, of understanding, and of appreciation of our human spirits. To Ning Mercer, the world of art making allows her to stretch and to grow both as an artist and as a living being. "It teaches me humility, humanity, and honesty. Life’s beauty is everywhere – by seeing, by feeling, by listening, and by smelling. I am truly lucky to be in a profession where everyday I get a second chance to better express this beauty with my artwork, hoping that others can share it with me." 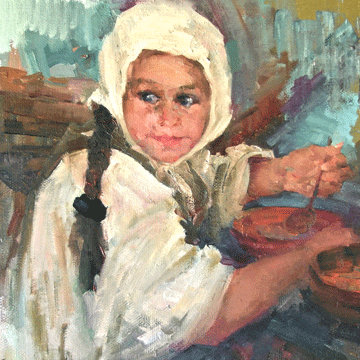 Ning Mercer’s studio is located in Mill Valley in Marin County, California. She is currently represented by Gallery Diamante in Carmel. Her artworks have been included in exhibitions by Oil Painters of America, California Art Club, Marin Museum of Contemporary Art, Pacific Art League, Studio Gallery in San Francisco, among other art institutions. More information about her work can be found at www.ningmercer.com. Opening Reception November 23, 5-7 p.m. Artist Talk: October 19, 2-3 p.m. Opening Reception October 12, 5-7 p.m. The exhibition features a variety of Hudson’s work, including sculptures, ceramic pieces and drawings. As one of the progenitors of the West Coast assemblage movement, Hudson is well known for his use of disparate everyday objects including everything from an ornate heating grate to a broken enameled sink. The work can appear to be an unruly mix of elements at first glance but soon reveals itself to be a carefully ordered interlacing of textures, color and geometric forms. Robert Hudson has an exhibition history that spans more than 50 years. A long-time Bay Area resident, he was an integral part of the San Francisco Funk Art movement in the 1960s and is a contemporary and longtime friend of Richard Shaw and William T. Wiley. Hudson currently resides in Cotati, where he continues to create works in his studio. Even his older works are continually evolving, as he often goes back and changes or adds new elements to the original sculpture. Hudson has a deep understanding of his materials, and he combines discarded artifacts to create visual harmonies that make unexpected visual sense. 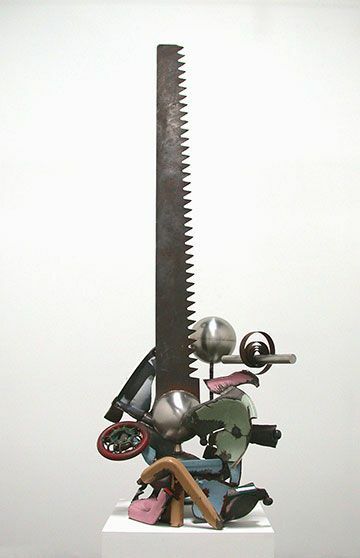 We can see the shapes playing off each other in his sculptures, as in his piece Crosscut, where the line of triangular saw blade juts out in stark contrast to the smooth curves of spirals, rods, and spheres surrounding the base. 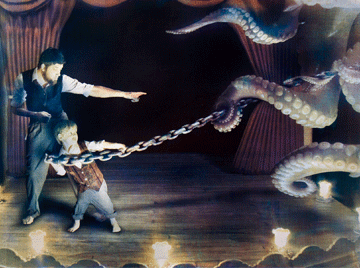 He also engages the viewer in a bit of sleight of hand, as materials are not always what they seem to be. His piece, Blue Rope Jar, fools the eye by including a rope actually made of porcelain instead of fibres. Despite the fact that some of the materials he uses are heavy or industrial, the resulting sculptures have a lightness that is expressed both in tone and composition. Hudson’s work has a signature wit that infiltrates all the media he works with, and leaves the viewer with a smile. Hudson’s works are included in the collections of the SF MoMa, NY MoMA, Whitney Museum, Los Angeles County Museum, Smithsonian National Gallery, deYoung Museum, DiRosa Preserve, Chicago Art Institute, The Art institute of Chicago, and the Stedelijk Museum inAmsterdam. He has taught at several California art institutions including the San Francisco Art Institute, the University of California at Berkeley, the University of California at Davis, and the California College of Arts and Crafts. This LEGENDS OF THE BAY AREA exhibition was made possible with the assistance of the Patricia Sweetow Gallery. Marin Museum of Contemporary Art presents a National Show on Photography that represents new directions and fresh voices within the genre. 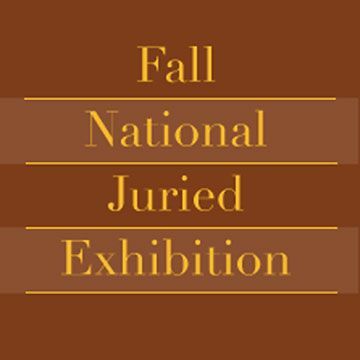 This show includes 50 artworks from around the nation that integrated photographic processes and materials. Many of the artists represented move fluidly through old and new processes, incorporating conventional darkroom techniques and digital manipulation in the creation of their works. Simon Pyle’s work pushes at the edges of digital media’s capabilities by displaying a jpeg image evolving and degrading as it is resaved 262,144 times in his piece Grandpa Back from the War. C. Wright Daniel’s work is camera-less, but uses the paper and photographic chemicals to create abstract prints of crumpled planes. MarinMOCA member Christie Stewart’s work incorporates flash bulbs and other miscellaneous photographic equipment into thoughtfully assembled grids. Other works include 22 year-old San Francisco artist Chantel Beam’s photo entitled Girl Gang, which integrates fashion photography and narrative portraiture, and LA artist Douglas Ito’s photo of a lone milk jug is emblematic of the isolation and empty promises of a consumerist culture. The juror for this year’s exhibition is Jessica Brier, curator and writer based in the San Francisco Bay Area. As Curatorial Assistant of Photography at the San Francisco Museum of Modern Art (SFMOMA), she has assisted in organizing exhibitions including Francesca Woodman (2011), Jay DeFeo: A Retrospective (2012), and South Africa in Apartheid and After: David Goldblatt, Ernest Cole, Billy Monk (2012). Independently, she has organized exhibitions at the Wattis Institute of Contemporary Art and Park Life, in San Francisco, and Headlands Center for the Arts, in Sausalito. She has contributed writing to Art Practical (artpractical.com), art on paper magazine and SFMOMA’s blog, Open Space. She holds a BA from New York University and an MA in Curatorial Practice from California College of the Arts. Ms. Brier will give a talk on her process and the themes of the show on September 21, at 6 pm at MarinMOCA. Marin Museum of Contemporary Art’s upcoming exhibition, Bird & Flower: Poetic Paintings by Wu Tianyu will bring Chinese Painter Wu Tianyu’s work to North America for the first time. This exhibition of large scale ink paintings on rice paper is a significant milestone in Wu Tianyu’s career as he explores and innovates on the journey of popularizing traditional Chinese culture and art forms. 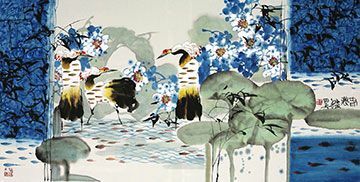 The artist incorporates the styles and subject matter of traditional Chinese painting, but purposefully re-weaves their grouping and composition into contemporary works of art that emphasize purity of form. He unites elements such as snow, foliage, and birds with modern aesthetic theory to yield something truly inventive. Using bold saturated color, he juxtaposes organic and geometric elements to create works that are both riotous and ordered. He eschews conventional compositions and lets the leaves and blossoms become designs and patterns, blurring the line between representation and abstraction. This exhibition will be a part of MarinMOCA’s participation in Asian Contemporary Art Week, a collaborative event from the Asian Contemporary Arts Consortium that celebrates and promotes Asian contemporary arts and design practices throughout the Bay Area, taking place September 19th through the 25th. Join us for the opening reception on July 20th. Our Member Artists will be working with the theme "Out of Order." The exhibition challenges ideas about expected progressions and compositions by deconstructing, rearranging and re-configuring its subject matter in unexpected ways. 100% of the proceeds go to support MarinMOCA’s programs and activities. Don’t miss this eclectic, highly creative show. It is full of whimsy and humor as well as some serious art work by many well known Bay Area artists. MarinMOCA thanks Beso Restaurant, Ravenswood Winery, Tavola Italian Kitchen, and Polly Ann Bakery for their generous donations and support of this event. The Marin Museum of Contemporary Art in Novato, California, will present AB/NORMAL, an exhibition featuring the work of emerging artists Dan Herrera, Paula Moran, and Aron Meynell, who skew the idea of normalcy through surreal and nostalgic narratives. Together the work conveys the fragile nature of “normal” and how reality's narrow confines are easily upset. Dan Herrera's photographic series Vaudeville uses a combination of 19th Century printing techniques and digital photography to create tableaus of enigmatic science-fiction characters. Aron Meynell's paintings and delicate charcoal drawings are populated with isolated figures in post-apocalyptic surroundings. Paula Moran's detailed and realistic ceramic objects create a life-size replica of the family room from her youth, complete with ceramic couch, beer bottles and burnt cigarettes. Collectively the artists of AB/NORMAL explore the disorientating twists of this uncertain world with impressive skill and a deft mastery of mood. Paula Moran holds a BA and MFA from San Francisco State University. Her recent exhibitions have included group shows at the John Natsoulas Gallery in Davis, Martin Wong Gallery, 111 Minna, and SFMOMA Artists Gallery at Fort Mason Center in San Francisco. The eye-deceiving objects she creates transcend their everyday nature and becomes uncanny witnesses of a memory that is at once made real and surreal. The objects are the unspoken catalyst to story-telling, allowing passage to the past. In her work viewers must question for a moment "what is truly real?" and "what is truly normal?". 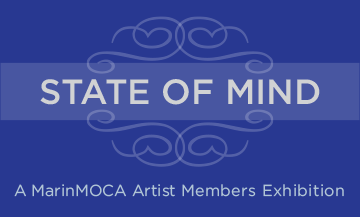 The Marin Museum of Contemporary Art will start off 2013 with an exhibition featuring Artist Member artwork that explores the concept “state of mind.” State of mind can refer to a wide range of emotional or psychological states, including peace, anxiety, happiness, grief, rage, and everything in between. The concept can also refer to a governed area, whether a nation or a territory within a nation. Artworks in the exhibition, therefore, may represent an exploration of the basic concept of a “state of mind,” the artist's personal state of mind, or the mindset of a region, state, or country. The work of MarinMOCA Artist Member Gale McKee, for example, entitled Memory: Palm Desert, 1930, has a nostalgic feel. The slightly blurred image includes a young girl dressed in a hat, scarf, jeans, and jacket, leaning confidently against a saddled horse. The area of the canvas surrounding the figure and horse is relatively empty otherwise, consisting primarily of swirled colors, perhaps clouds. McKee keeps the context vague, making subtle reference to the popularity of photos of children on horses throughout the early to mid-1900s. The subtlety of the work allows viewers to travel back in time on their own terms to an idealized moment in childhood full of color and smiles. MarinMOCA Artist Members work in a variety of media, from acrylic and oil paint on canvas, to watercolor on paper, to encaustic (wax), to photography, to sculpture of all types. The MarinMOCA Collins Gallery will feature the work of MarinMOCA “Stars,” Artist Members who have demonstrated extraordinary volunteer service to the organization. There will be something to please, challenge, and intrigue any viewer! Joan McLoughlin, Director of the McLoughlin Gallery at 49 Geary Street in San Francisco, will serve as juror.